BookFunnel is a common book delivery service that many authors use to deliver their free book to contest winners. To be able to deliver a free book through BookFunnel, you will need their paid First-Time Author account ( see BookFunnel's account options and pricing here). 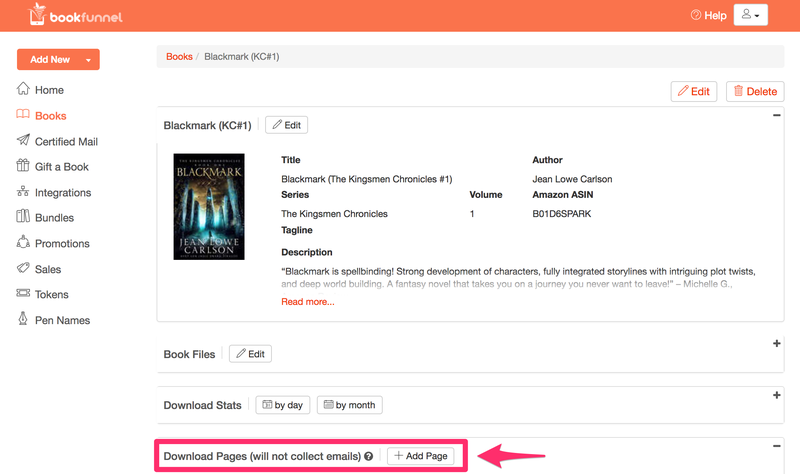 Log in to your BookFunnel author dashboard, navigate to the "Add New" button —> select "Add New Book" from the dropdown. Add your book details, upload files and cover image, and hit "Save Book". Click on your book from your dashboard, scroll down to "Download Pages" and click "Add Page". For delivering your free book to the winners, select the option that does NOT require an email address. On the next page, add your download page details, and hit "Save Download Page". Email the download page link to the contest winners! *Note: For BookSweeps Author Email Spotlight promotions, you'll need a BookFunnel Mid-List Author plan or higher to add subscribers to a mailing list via a free book download link. This requires a mandatory opt-in link to be set up for your book, so all the readers coming your way from the promotion are added to your email list for downloading the book. Click on your book from your dashboard, scroll down to "Giveaway Pages" and click "Add Page". Add your giveaway page details, and hit "Save Giveaway".